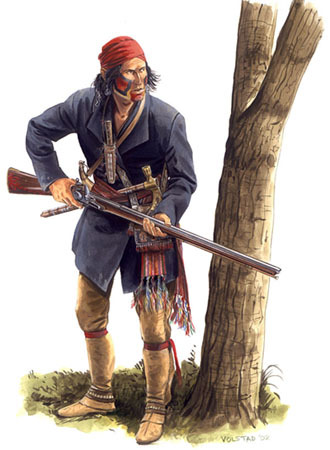 A Mohawk warrior c. 1812 wielding the ubiquitous Northwest Trade Gun. art by R. Volstad. I guess you can’t make it as a white male in academia without tugging the forelock to current pieties about gender, “white privilege” and colonialism, etc. It must be tough. Hope it’s worth it. I’m glad I left, cuz I’m not one to truckle to cultural mandarins. Reading a book on the Bushwhackers of the Civil War, I was struck that the author was profoundly drawn to these wild figures — and he had to excuse his fascination by running his thesis and his language through a strainer of blather about gender and masculinity and such. It’s a good book, but I find the obsequiousness pathetic. The author, James A. Warren, is a successful author of military history and a former visiting scholar in the American Studies Department at Brown University. He takes a slightly different tack, employing an arch, oh-so-ironic and knowing wink-and-nod so that he can be a gun guy and be fascinated by gun guys and still keep his academic card. Bah! I almost stopped reading — but I’m glad I didn’t. After getting through the first five paragraphs of virtue-signaling by an oh-so-self-aware gun owner, we get to the meat of the story — an introduction to yet one more book that I MUST have. 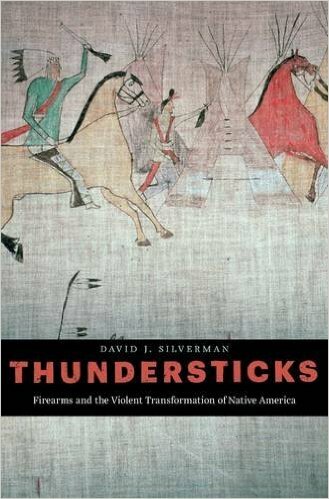 David J. Silverman, a professor of history at George Washington University, makes a lively and compelling argument in his new book, Thundersticks: Firearms and the Violent Transformation of Native America, that the conventional wisdom about the origins of our gun culture needs emending. Yes, Europeans created and manufactured firearms, but in colonial America, it was the Indian who first fully embraced the gun, and mastered its varied applications. In fact, says Silverman, for more than 200 years, Indian peoples across the breadth of the North America employed firearms to transform not only their way of war, but their methods of hunting, and even their diplomacy with other Indians, and the great colonial powers of England, France, Spain, and the Netherlands. Guns — buying, selling, and using them — played a crucial role in the rise and fall of scores of Indian groups and tribes, often at the expense of other Indians. Along what Silverman calls the “gun frontier”—a continually shifting zone of contact just beyond the outer reaches of Euro-American settlement, where Indians outnumbered whites, Native American peoples were well positioned to trade their friendship, military assistance, and animal pelts for large quantities of the finest firearms. “Indians used their arsenals to cut off indigenous enemies from the arms trade, and seize hunting grounds, slaves, and horses” from other Indian groups. And of course, they employed those same arsenals to defend their autonomy and territorial integrity from European encroachment. Of course, I immediately downloaded a sample of Thundersticks and found, much to my satisfaction, that Silverman does not seem to be cherry-picking his history in order to grind a contemporary socio-political ax. He’s simply and gloriously digging in to some real-deal frontier history. Thundersticks opens with the 1877 surrender of Lakota chief Crazy Horse — who made a point of negotiating a hand-over of his peoples’ firearms as opposed to confiscation. It was an important symbolic point for the war leader. Crazy Horse himself turned over three Winchester rifles. Crazy Horse was a Winchester man. The great John Clymer depicted him leading a charge at the Battle of the Rosebud, 1876. Based on the table of contents, it appears that Silverman covers a wide range —geographically and temporally — and he’s not just hitting on the most well-known stuff. King Phillip’s War, the Seminole Resistance, the Fur Trade, Indian gunrunning… Yeah, I’m all over this. I refrained from clicking the purchase button on the Kindle — this is one I’m going to want for the shelf. Never could do it, myself. Prideful, I guess. Or maybe it’s self-preservation. My wife occasionally points out that if I’d stayed in that environment I’d have ended up in jail. I’ll continue operating out here in the hinterlands, surrounded by my own Thundersticks — and knives and tomahawks. I will continue to unabashedly love my wild, badass Frontier Partisans — without irony and with no apologies. And now I’m gonna call my local indie bookstore and order up a copy of Thundersticks. This reminds me of one of the Comanches in one of McMurtry’s “Lonesome Dove” prequels. While he bore no special hatred of white people, he loved their guns and he found that the easiest way to acquire them was to kill the white people and take their guns. So he became the biggest whiteman-killer in the tribe. Because he was a gun guy. As is often the case here, you post on something that is kinda/sorta related to what has been turning around in my head for the last couple days. You have more experience in academe than I do and there are others here from that world and I am curious what the academic research in the following area might be. A few years ago, I read a little of the academic criticism of Laura Ingalls Wilder books. One aspect of this focused on Ma’s hatred and fear of Indians, couched in the usual “Racist, Xenophobic, Fear of the Other” stuff. It is indisputable that one of the themes of the series is that Ma hated and feared Indians and Pa gave off more of a “Indians are so cool” vibe. I was really frustrated by the fact that none of the stuff that I read looked at it from Ma’s view and asked what may have lead to Ma’s views and I was tempted to respond in some way. As I get older, I realize that women on the Indian frontiers had to know, to their very core, that they could wake up at any time to a dead husband, slaughtered children, raped and murdered daughters-etc. Ma Ingalls was probably the beneficiary of decades/generations of “Kitchen Stories” that the women told about Indians-etc. Then as a very young, married woman in Wisconsin in 1862, the Minnesota Massacre/Dakota War broke out and confirmed every fear that frontier women had to feel. She may have even had first-hand stories as Minnesota settlers pulled back from the frontier into Wisconsin and so forth. In the odd ways that my mind works, I started thinking about Lucy’s scream in The Searchers and started thinking of that scream as a collective fear of frontier women as Lucy realized this is really going to happen to me. Damn that’s a fine bit of work right there, Breaker. Seconded. Also, a prime example of modern thinking mis-applied to historical settings – i.e., it’s difficult to look at the sad state of the American Indian today and feel anything near the terror one might have experienced were this the Comancheria in 1850. Any such impressions then put to paper as true tend to pale somewhat, the moment have passed. Much like dangerous animals behind glass and bars at the zoo, an apex predator removed from its home environment fast turns from an object of fear to one of fascination and eventually to pity. A markedly different point of view than would be held by the man who’s hunted and fought them on their own ground. …an apex predator removed from its home environment fast turns from an object of fear to one of fascination and eventually to pity. Just for fun, I paged through the book “Little House on the Prairie”-and there was a chapter where 2 Indians visited the house when Pa was gone and, after, he made it very clear how serious it had been. The girls had wanted to let their dog go-if they had done that he would have bitten the Indians and they would be dead. There was also a direct reference to the Minnesota Massacre as some of their neighbors in the area were survivors of that. So obviously, Ma had firsthand accounts. I live 20mi east of the LHotP site. As I recall, those were Osages. The Osages were known to be big, warlike Injuns. Archaeologists excavated an Osage village a mile from my house when I was in 6th grade. My maternal great-greatgrandfather was already homesteaded here when the Ingallses moved away. My mom and both my sisters were big LIW fans. Sadly, my two teenage nieces are not. Very much city girls. However, I have a feeling my little niece in Texas will go in for those books big time. One could almost look upon fights like that as a sorta-kinda parallel of the “Hun Domino Effect” at the end of the Roman Empire. The Huns showed up with several military innovations and began pushing the formidable peoples in the East westward. Those ended up clashing with and taking land from peoples in the West. Eventually, the Huns tried to take it all. The Native American tribes never had a “Catalaunian Plains” moment, however. Obviously, despite the parallels, there are also significant differences. I just found something on the Osage and raids on settlers. On Wiki. Speaking of forgotten Indian Wars-my goodness. The British Empire method. Most effective. Hard to find a more effective empire than the British. Then again, all empires are ineffective in the end. If you can’t repair a hole in your boat, it doesn’t matter how “effective” your bailing is. It will sink eventually. Empires come designed with a hole in the boat. Every last one of ’em. Genetic engineering is the only way around it. I vote for no empires, instead. Like the metaphor. As for the American Empire, our bailing is getting less and less effective. Tribal conflict dies hard. In fact, it never really dies at all, does it? Re: Native Americans getting guns by killing Europeans- in his excellent memoir “Mr. Grizzly”, Montague Stevens, an English remittance man who took up ranching in west-central New Mexico while the Apache wars were still ongoing, tells of talking to an Apache who had returned to the area many years later and having the man describe watching Stevens ride to and from town during the hostilities. When Stevens asked why he hadn’t been ambushed, the warrior explained that Stevens (who typically carried a pistol in his saddlebag) didn’t appear well enough armed to make an ambush and subsequent escape of pursuit or retribution worthwhile. Awright! Another reader of the poorly titled “Meet Mister Grizzly”–one of the BEST firsthand accounts(with LOTS of dog and other critter stuff for us animal geeks!) of life in the Southwest–that title turns off a lot of potential fans, alas. Montague Stevens, the author(and a one-armed amputee Englishman) was one of the most amazing characters, and LIGHT YEARS ahead of everyone of his time in his compassion and training and care for his animals, hunting dogs as well as horses. I admire him so much, I have a framed photo of him with some of his bloodhounds on the wall in my “dogroom” at home! Another interesting thing he noted about the illiterate Apaches he knew, who were such amazing trackers–he theorized that despite their inability to read books, their minds had literally developed differently from literate whites, which concentrated their ability to read sign in tracking, so much superior to the Europeans, that the whites seemed “tracking illiterate” to the Apaches! I don’t know how you could set up a study to verify that, but it intuitively seems right. Same for the Bushmen. It MUST be the same as learning to read squiggles on a page.